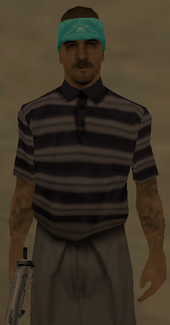 Sunny is a character in the 3D Universe who appears as a minor character in Grand Theft Auto: San Andreas (set in 1992). He is a member of the Varrios Los Aztecas gang. He speaks during his only appearance, although the voice actor is not credited. Sunny, at an unknown time, joined the Varrios Los Aztecas and rose to a prominent position within the gang. He, Gal and Hazer accompany their leader Cesar Vialpando and Carl Johnson to take back El Corona from the Los Santos Vagos, their arch rivals. The five battle their way through an alleyway on their way towards Cesar's home when they are ambushed from behind by the Los Santos Vagos. Sunny is shot and takes shelter in a garage, sitting next to a car bleeding, although he later appears without an injury, shooting rocket propelled grenades towards Los Santos Vagos gangsters. Sunny says that he is 'gonna cut those cacos' despite holding a TEC 9, with Hazer holding the only sword. This page was last modified on 9 November 2013, at 22:12.